Raising My Rainbow: by Lori Duron. A frank, heartfelt, and brutally funny account of her and her family's adventures of distress and happiness raising a gender-creative son. Whereas her older son, Chase, is a Lego-loving, sports-playing boy's boy, her younger son, C.J., would much rather twirl around in a pink sparkly tutu, with a Disney Princess in each hand while singing Lady Gaga's "Paparazzi." Allies & Angels: by Terri and Vince Cook. This is a story of strength, compassion and unconditional love--sharing how these parents supported their son's transition and the lessons learned along the way. Learning their daughter was really their son taught them who they are and who they want to be. This moving story highlights how allies guided and supported them on what they once feared was an unthinkable path. This book will inspire readers to look at their life differently and embrace their role as an ally. No matter who you are or how you identify, this book will challenge you to find a new acceptance for all and a deeper love for your loved ones. For 15 years, the proud parents of two young men believed their younger son was their daughter. 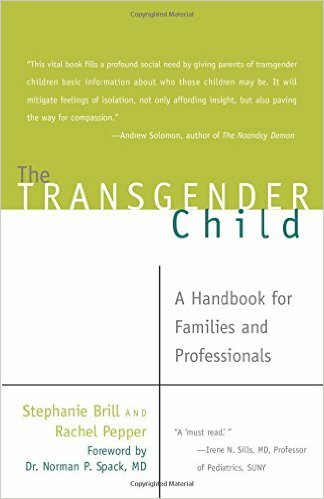 The Transgender Child: by Stephanie Brill and Rachel Pepper. This comprehensive first of its kind guidebook explores the unique challenges that thousands of families face every day raising their children in every city and state. Through extensive research and interviews, as well as years of experience working in the field, the authors cover gender variance from birth through college. What do you do when your toddler daughter’s first sentence is that she’s a boy? What will happen when your preschool son insists on wearing a dress to school? Is this ever just a phase? How can you explain this to your neighbors and family? How can parents advocate for their children in elementary schools? What are the current laws on the rights of transgender children? What do doctors specializing in gender variant children recommend? What do the therapists say? What advice do other families who have trans kids have? What about hormone blockers and surgery? What issues should your college-bound trans child be thinking about when selecting a school? How can I best raise my gender variant or transgender child with love and compassion, even when I barely understand the issues ahead of us? And what is gender, anyway? These questions and more are answered in this book offering a deeper understanding of gender variant and transgender children and teens. It Gets Better: Coming Out, Overcoming Bullying, and Creating a Life Worth Living by Dan Savage and Terry Miller. Growing up isn't easy. Many young people face daily tormenting and bullying, and this is especially true for LGBT kids and teens. In response to a number of tragic suicides by LGBT students, syndicated columnist and author Dan Savage uploaded a video to YouTube with his partner, Terry Miller. Speaking openly about the bullying they suffered, and how they both went on to lead rewarding adult lives, their video launched the It Gets Better Project YouTube channel and initiated a worldwide phenomenon. It Gets Better is a collection of original essays and expanded testimonials written to teens from celebrities, political leaders, and everyday people, because while many LGBT teens can't see a positive future for themselves, we can. Roland Humphrey is Wearing What? : by Eileen Kiernan-Johnson - Is the story of a little boy's quest to be his authentic self, dressed in pink and festooned with sparkles, in a world that frowns upon boys who like "girly" things. Jacob's New Dress: by by Sarah Hoffman and Ian Hoffman. Jacob loves playing dress-up, when he can be anything he wants to be. Some kids at school say he can't wear "girl" clothes, but Jacob wants to wear a dress to school. Can he convince his parents to let him wear what he wants? This heartwarming story speaks to the unique challenges faced by boys who don't identify with traditional gender roles. Red: A Crayon's Story by Michael Hall. Red has a bright red label, but he is, in fact, blue. His teacher tries to help him be red (let's draw strawberries! ), his mother tries to help him be red by sending him out on a playdate with a yellow classmate (go draw a nice orange! ), and the scissors try to help him be red by snipping his label so that he has room to breathe. But Red is miserable. He just can't be red, no matter how hard he tries! Finally, a brand-new friend offers a brand-new perspective, and Red discovers what readers have known all along. He's blue! This funny, heartwarming, colorful picture book about finding the courage to be true to your inner self can be read on multiple levels, and it offers something for everyone.